12 Cupcake Toppers and 12 Pikachu Temporary Tattoos. Pokemon theme Pokeball replica capsules. ABS Plastic red/white/black. Size 1". 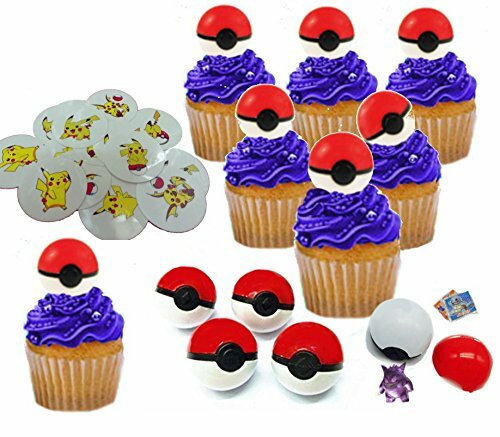 Awesome cupcake toppers and take home souvenir toy for your Pokemon theme party. Your party guests will be delighted to find hidden surprise toy figure and stickers inside their cupcake topper! 12 Poke Balls cupcake toppers each filled with little mini Pokemon figure, 2 Pokemon mini stickers and 12 Pikachu temporary tattoos. Pokemon theme Pokeball replica capsules look great on top of cupcakes and cakes. Also great for party favor bags. Manufacturer: Nelso Toys & Co. Brand: Nelso Toys & Co. Publisher: Nelso Toys & Co. Studio: Nelso Toys & Co. If you have any questions about this product by Nelso Toys & Co., contact us by completing and submitting the form below. If you are looking for a specif part number, please include it with your message.